I shall attempt to very briefly summarize/highlight the esteemed points of Arjaan Mun's amazing life and his greatness. 1) Though Arjaan Mun must have possessed many amazing psychic powers to a very high level, he never stressed those in his teachings. 2) He adhered strictly to the Buddhist percepts. He lived with minimal material possessions. Apart from his robes of discarded cloth and his alms bowl, he owned nothing else. He lived the life of a ascetic that is hardly found today. 3) He had the ability to communicate with invisible beings from many realms (from the lower to the higher realms). He was even able to teach the Dharmma (teachings of the Buddha) to devas (celestial or heavenly beings). 4) He went against the Orthodoxy/Convention of his time. While many Thai Buddhist monks were required to live in monasteries at that time as this was regarded as a wise political move by the Thai Royal Family to mobilize the Sangha (Buddhist clergy) to counter the political ambitions of Western powers (who were using Christianity to attempt to convert the Thais and hence gain political power over them), Arjaan Mun was one of the early pioneers of TuDong/ the Forest Tradition. Arjaan Mun went into the forests to seclude himself from worldly affairs and seek the Truth of the Dharmma (teachings of the Buddha). 5) Arjaan Mun relied a great deal on himself to reach Englightenment. 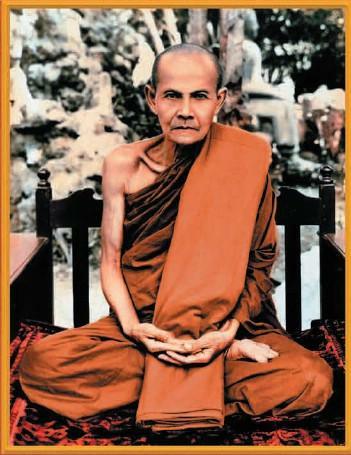 Although in the beginning he had Arjaan Sao as a teacher, Arjaan Mun's later experiences were such that they were not within the scope of Arjaan Sao's (Arjaan Sao is another great Thai guru monk and the earliest or one of the earliest pioneers of the Thai Buddhist Forest Tradition) experience. Through Arjaan Mun's determination, ingenuity, resourcefulness and mindfulness, he was able to overcome the obstacles he faced and gained Enlightenment in one lifetime. I would like to thank crazyred121 for writing to me and telling me about her personal experience with LP Tuad. I would also like to thank her for giving me permission (without my asking for it) to post her experience in my blog. 1) She is a Singaporean female enthusiast/fan of Thai amulets. It is truly rare to find a girl like her in Singapore who can appreciate Thai amulets. 2) At the time of this posting, she is young (20 years of age this year, 2005) and from her internet photo, seems quite pretty to me. He has such a compassionate heart to bless those worthy of his help & protection even though some of them are wearing fake amulets. You can post this incident if you like. On Sept 2004, I cannot recall the date, I was sitting on my friend's bike and this guy and girl was on another bike. Both bikes were speeding at PIE when this taxi crashed sideway to the other bike. I watch with my own eyes the girl who is my close friend fly out of the bike while the guy slide over a long distance with the bike. Thanks god there was no cars behind us if not... The taxi crashed into them so hard and seeing her flying in the air like that, I thought she is going to die. She and her bf substained injuries and her bf had a few stiches on his legs.Both are otherwise, safe and sound. Both are wearing LP Tuad amulets. the guy just put the amulet which he got THAT day in his t-shirt pocket. the crash has his helmet flying off his head but the big impact did not make the amulet drop out. Hence, I believe LP Tuad saved my friends. Even the docters were amazed that they did not suffer a broken arm or leg." I heard it from a friend (Eugene Tan) that he heard this from a seller of amulets. This seller of amulets has a friend working in the mortuary in Bangkok. According to the amulet seller's friend, he has never seen an amulet of LP Tuad on any body that has died from accidents. This amulet seller also said that Arjaan Tim (or Luang Phor Tim) has said that LP Tuad has communicated to him (I am unsure as to how, but possibly through a manifestion of his presence) that he will even protect those worthy of protection if they are wearing fake amulets of LP Tuad. This shows LP Tuad's great compassion indeed. I heard another story from my friend Johnson. Johnson has said that he met an interesting person in an amulet shop in Singapore. This person (who has his own business and is self-employed; he owns a flower business or something?) knows black magic (probably of an eastern tradition or system). This person wanted to see which of his amulets can protect him from black magic. So he cast black magic on himself while one by one testing his amulets (by wearing them I suppose). He found out that only his LP Tuad amulets protected him from black magic. Then he became curious and wondered if his fake LP Tuad amulets would offer him the same protection. Again, he tested his fake LP Tuad amulets. To his astonishment, even his fake LP Tuad amulets protected him. No amulet, no matter how powerful, can or will protect a person who is to suffer the effects of his past bad karma. Holy amulets will not protect those who have evil in their hearts. In fact, no amulet or magical item can protect those who have done too much evil and it is time for them to suffer the effects of their bad karma. No God or Demon can protect evil beings from their bad Karma. The crew was furious! They thought that this monk was trying to pull a fast one on them (that is, they thought he was trying to trick them). After LP Thuad's assurance that the water is actually drinkable, one of them decided to give it a try. He found that the water was indeed fit for consumption! Soon the rest of the crew went to drink the water to verify it for themselves. One curious crew member purposely tasted the water outside the circle and shouted that it was salty. The crew soon abandoned their thoughts of harming LP Thuad. 1) In the beginning of 1963AD, Lokhunpakpaliang in Thailand was hit by typhoon. The resulting floods caused great loss to the population who were mostly fishermen. Houses were swept away, numerous people were wounded, reported missing and lost their lives. Those wearing the images of LP Thuad were apparently safe and sound. This is reputed to be a well-known incident witnessed by many people. 2) A bus on the Singora-Haadyai route fell into a deep chasm due to the very dangerous roads in the mountains. All passengers were unharmed and it was later found that all of them were wearing the images of LP Thuad. The Thai newspapers has published many of such news from time to time. To the faithful, this is proof of the supernormal powers of LP Thuad as well as the greatness of the Buddhist religion. 3) One incident I came across online related that a certain batch of his amulets reportedly protected someone from M-16 gunfire. That batch of LP amulets became known as the "M-16" LP Thuad amulets in amulet circles. 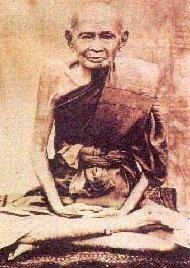 Luang Poo Yiam Wat Nang, Bangkok passed away at the age of 94, on 29th April BE2469 (1926 AD). Luang Poo Yiam or Jow Koon Dtow is a very famous monk in Thailand, especially to those who like to collect his Kreung Rahng(magical items) and rian amulets. 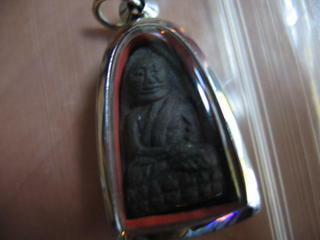 Luang Poo Yiam's rians are the top amulets in the series of BenJaPahKeeRian (the Great Five Rians). Luang Poo Yiam was born in Bangkok on the 5th August BE2375 (1832 AD), during the 3rd Thai King's Reign. At the age of 9, Luang Poo Yiam began his formal studies at Wat Nang. Later, when he was 11 years old, he went to study at Wat Bowan, and after sometime, he moved to Wat RahtBurRaNa to continue his studies. At the age of 19, Luang Poo Yiam was ordained as a novice at Wat Nang for a short period of time. When Luang Poo Yiam was 22 years old, he became a monk at Wat RahtOhRaSahRahm, and his preceptors were Pra SutTuMaTeRa (Gert), Pra TamMaJaDee (Jeen) and Pra Ah Jahn Rort, Wat Nang Norng were his Dhamma teachers. Later on, Luang Poo Yiam also studied Dhamma (the Buddha's teachings) under Pra PahWaNahGohSon(Rort), Pra TamMaJaDee and Pra SangWonWeMon(Men). Luang Poo Yiam was a very hard-working monk, and very soon he was promoted to Pra BaiKiGah(monk title) and subsequently became Pra PaLatTahNuKrom (monk title). When Luang Poo Yiam reached 16th PanSah(rain retreat), the 5th Thai King bestowed the title of Pra Kru on him. Luang Poo Yiam returned to Wat Nang and became its head abbot. In BE2442 (1899 AD), Luang Poo Yiam attained the title Pra RahChahKaNa. Luang Poo Yiam was a monk who observed the precepts (code of conduct) of a Buddhist monk strictly. He never accepted material things given to him by the lay people, except those which were meant to build Wat Nang. Many people respected Luang Poo Yiam, and his Metta(Loving Kindness) was well-known both far and near, such that many people would bring their children to be ordained under him. The 5th Thai King was one who respected Luang Poo Yiam very much and treated him as his teacher. It Soh Dta Put Tat Pi Dti It"
Luang Poo Yiam was never arrogant despite his popularity and the attention bestowed on him. Instead he always mentioned that he was just an ordinary monk, and was not as good as any of his teachers who had taught him Dhamma (teachings of the Buddha). Note: I hope this tribute to Luang Phor Yiam is a worthy one to such an esteemed Buddhist monk. This blog represents my tribute to some of the most well-respected Thai Guru Buddhist monks.